Keratoconus is a condition in which the cornea (the transparent front layer of the eye) in front of a prominent cone, causing a progressive weakening of vision. As the cornea becomes more prominent, the surface is thinner and the irregularity increases, and sometimes opacity is formed in the surface. Although Keratoconus is considered a common condition, its causes are still unknown. It is believed that Keratoconus is basically inherited; as well as spring conjunctivitis which accompanied with chronic eye rubbing which leading to weakness of the tissues of the cornea and extra prominent. About one out of 2.000 person will develop Keratoconus among the population in general. The symptoms of the disease with started in the onset of adolescence, and the disease is hidden in the early stages of Keratoconus where patients complain of deteriorating vision. And, over time, often the patient feels a rapid deterioration in vision, So Keratoconus patients need to change their glasses frequently as their visual distortion correction significantly changes, in the advanced stage the condition may rapidly progresses to cause opacity or scars which leads to poor vision. If laceration occurs in the posterior layers of the cornea, severe vision loss may be resulted. Eyeglasses or soft contact lenses usually help in correcting the vision acceptably in the early stages. However, as the disease progresses and the cornea develops the cone shape, eyeglasses no longer provides adequate vision correction. In such case, Gas permeable contact lenses (rigid lenses) are the preferred treatment which is considered the permanent solution to most of Keratoconus patients. Optometrists of this hospital have broad experience in prescribing and determining the characteristics of lenses. They also offer the appropriate care with regard to lens design. Topography map of the cornea surface (a computerized picture of the eye surface) is drawn in the first visit of the patient to prescribe the required contact lenses. This procedure is repeated annually in order to analyze the cone shape of the cornea which plays an important role in designing the appropriate lenses. Most keratoconus patients face difficulty in adapting with the new lenses; however, the more they use lenses, the faster they adapt. It usually takes two to four weeks for the patients to start feeling relatively comfortable. Once the patient experiences the clear vision resulting from using the lenses, it becomes difficult to dispense them. Regular follow-ups and repeatedly changing of the lenses are needed by the keratoconus patients to maintain their comfort and visual acuity. It is significantly important to accurately follow the Optometrist instructions if contact lenses are prescribed. Corneal Collagen Crosslinking may be the solution for some cases of Keratoconus and is often advised to be used to treat the cases of increased curvature of the cornea. The main idea of the therapy is to direct ultraviolet waves to harden the cornea tissues which delay the occurrence of Keratoconus. This procedure is safe and has no complications if the necessary actions were taken before, during, and after the surgery under the supervision of a specialized ophthalmologist. Another procedure may be performed which is the Implantation of Intra corneal rings. These rings press in a certain way which leads to decrease the corneal curvature. Such procedure is used with the patients who have contact lenses intolerance and moderate keratoconus and is less invasive than corneal transplantation; however, it rarely leads to excellent vision As it happens in the corneal transplantation. Patient may need to undergo Corneal Collagen Crosslinking with or after the Implantation of Intra-corneal rings to strengthen the corneal tissues and prevent further curvature. If the disease compounds, which is the case of about 10% or more in keratoconus cases, keratectomy becomes essential. In this surgery, a large portion of cornea centre is removed and replaced by a cornea taken from a donor. Such surgery is one of the relatively common and successful surgeries. 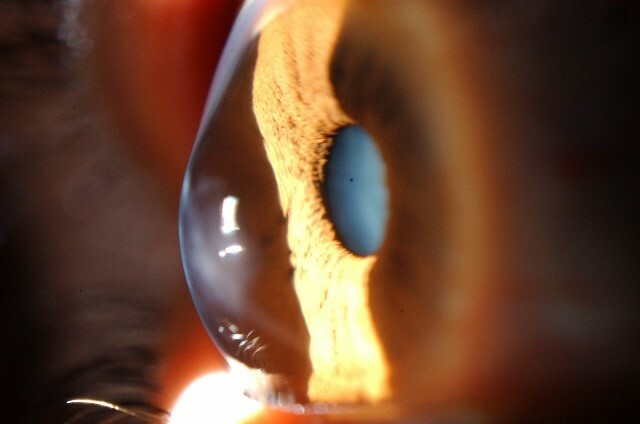 Cornea transplantation is only considered when the patient is not able to tolerate contact lenses any more or has poor vision while wearing contact lenses. It should be always remembered that despite the success of keratectomy, you may be obliged to use eyeglasses or contact lenses after few months of surgery until vision is stabilized.